[SatNews] As water backed up, local authorities expressed concerns about a potential flash flood. On March 22, 2014, a rainfall-triggered landslide near Oso, Washington, sent muddy debris spilling across the North Fork of the Stillaguamish River. The debris swamped numerous homes, resulting in the deaths of at least 24 people, according to news reports. As of March 25, dozens of people were still missing. Image on the bottom is before landslide, and image on the top is after the landslide. The landslide created an earthen dam that blocked the river, causing a barrier lake to form. The Operational Land Imager (OLI) on Landsat 8 acquired this image of landslide debris and the barrier lake on March 23, 2014. An image of the same area on January 18 is shown for comparison. Turn the comparison tool on to see how the landscape changed. 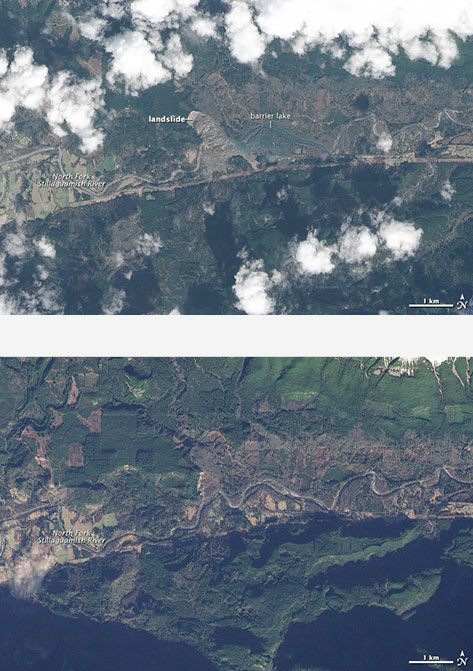 To see aerial views of the landslide, read this blog post. As water backed up, local authorities expressed concerns about a potential flash flood. On March 23, water began to flow around the north side of the dam. On March 26, a National Weather Service flood warning remained in effect for areas on the Stillaguamish River east of the blockage. According to Durham University geologist Dave Petley, the landslide was a reactivation of an earlier landslide that caused problems in 1988 and 2006. The Seattle Times has reported that retired U.S. Geological Survey geologist Daniel Miller warned the hillside had the “potential for a large catastrophic failure” in a report filed with U.S. Corp of Engineers in 1999. National Weather S'ervice (2014, March 25) Flash Flood Watch. Accessed March 25, 2014. Reading the Washington Landscape (2014, March 25) Stilliguamish/Oso Landslide. Accessed March 26, 2014. Sliding Thought Blog (2009, June 5) Landslide of the Week: Hazel Landslide. Accessed March 26, 2014. The Atlantic (2009, June 5) At least 14 Dead in Washington State Mudslide. Accessed March 26, 2014. The Landslide Blog (2014, March 24) Oso landslip:useful resources and the rising human cost. Accessed March 26, 2014. Scientific American (2014, March 26) Oso Mudslide: Links to the Geology Behind the Tragedy. Accessed March 26, 2014. Seattle Times (2014, March 24) Risk of slide ‘unforeseen’? Warnings go back decades. Accessed March 26, 2014. USA Today (2014, March 25) Wash. Landslide could be 2nd-deadliest in U.S. History. Accessed March 26, 2014. Voice of America (2014, March 25) US Mudslide Death Toll at 24, Scores Missing. Accessed March 26, 2014. Washington Governor Jay Inslee (2014, March 25) Photos: Snohomish County Mudslide. Accessed March 26, 2014. NASA Earth Observatory image by Jesse Allen, using Landsat data from the U.S. Geological Survey. Caption by Adam Voiland.